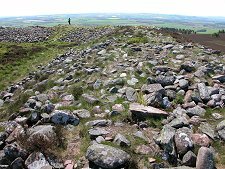 On separate hills that form the crest of the high ground rising to the north of Strathmore are the remains of two hillforts or hilltop towns. They are known as the Brown Caterthun and the White Caterthun. Their names refer to the different forms of construction, which in turn suggest rather different dates for the two hillforts. 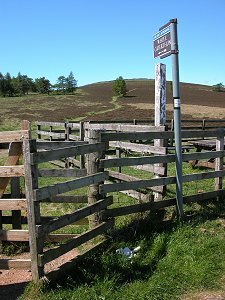 The Brown Caterthun comprised five or six concentric earth banks around the summit of a 287m high hill commanding remarkable views in all directions. The banks were made of turf laid over stone, and the overall effect today is of a series of raised lines under the heather. The Brown Caterthun may have been either defensive or ritual in purpose, and suggestions for the date of its construction range from 3,000BC to 500BC. 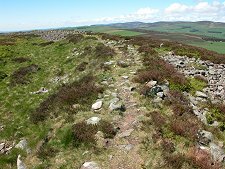 What seems more clear is that the Brown Caterthun was already out of use when the White Caterthun was constructed, probably by the Picts when they arrived in the area in the first centuries AD; and if so it could possibly have seen active use when Agricola's Romans passed this way en route to their victory at the battle of Mons Graupius in AD84 (see our Historical Timeline). 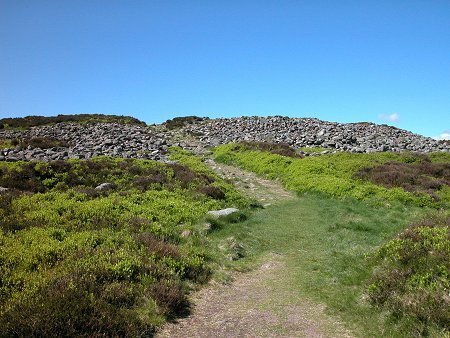 It comprised a massive oval stone rampart around the top of the hill at a height of 298m, now marked by a broad band of stones following the line of the original rampart. 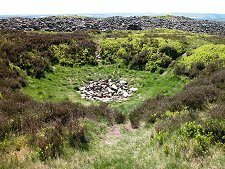 Within the White Caterthun is a stone-filled pit, presumably used as a quarry or well. Access to the Caterthuns is from the minor road that passes between them en route to Bridgend. A small car park has been provided, as has a picnic area. The paths to the Caterthuns head off in opposite directions and each is an out-and-back modest climb on good paths. The White Caterthun is the closer of the two, but even the Brown Caterthun is only a walk of 800m or so.